We have oh so many amazing women farmers in SE Minnesota and I have had the honor of following a few of them as they work on their farms during this past year. I’ve been taking pictures and notes in an attempt to remember details of our conversations and their lives while trying to keep up with them as they plant, plow, harvest, tend livestock and sell their products. Some have given me precious extra time to talk at their kitchen tables, or in their living rooms. Whether inside or out in the barns or fields I could follow and listen to them forever. They are incredibly hard workers in all that they do for their families, farms and communities. I am humbled by them. I finally realized that my goal of having an exhibit documenting this year of women farmers meant I had to start drawing and painting ASAP! I have gotten to work with brushes, paints, pastels and charcoal and am excited to share some of my pieces with you. The exhibit “Rooted In The Land” will be at the Winona Historical Center. The opening reception will be Saturday, April 14, 2018, so please save the date! Below is a painting from Esther Heyer’s farm in Nodine, MN. Esther farms with her husband Harley. She does an amazing amount of diversification with her crops as well as canning, baking and has even taught food fermentation. Her farm is a wealth of delicious and colorful food, some of which she brings to our local farmer’s market. 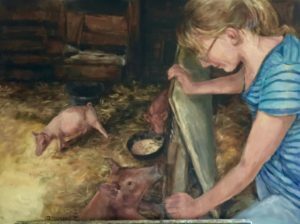 This painting is of Esther’s daughter Bethany and Bethany’s baby pigs. At a later visit I got to see how the babies have grown (quite large) and how much the pig who had jumped up in the barn to greet Bethany in this oil painting still loves to see her. In fact Bethany had to keep moving out of the way so that the pig that loves to be so close wouldn’t knock her over! My hope is to continue to introduce you to more of these incredible women and some of the pieces that will be in the spring exhibit. More to come soon! Great painting! You captured it well. We would go see the pigs when we visited to see how much they had grown. Esther is my sister-in-law and is very talented and hard working. Our niece Bethany really enjoys her pigs and ducks and does a great job raising them. Thanks so much Sharon! I love visiting Esther and her family. They work amazingly hard and have great family, animals, apples and produce to show for it!